Feel like you’ve lost your groove? Flip through this eclectic collection of Susan A. Marshall’s keen wit, observations, and chuckle-out-loud humor to take your spirits and regain your faith in humanity. 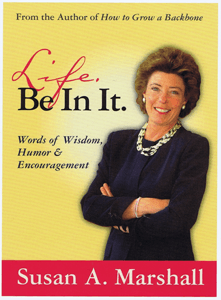 For nearly 30 years, Susan A. Marshall has been encouraging readers and audiences to take a clear-eyed look at life, find the opportunities it holds, and position themselves to pursue their dreams. She has challenged bad behavior, chuckled at our common human foibles, and championed best efforts. This delightful collection of her writing, dating back to newspaper articles from 1984, captures the challenges of our times and offers timeless inspiration. Here you will find lessons, reminders, and the occasional poke in the ribs we all need to maintain a healthy sense of perspective. This book offers a buffet of goodies to energize, comfort, and encourage you on those days that challenge your equilibrium. You’ll come back to it again and again to refresh and restore your spirits.